Lint free cleaning wipe used to polish, wipe down, buff, automotive interior and exterior surfaces, including winscreens, mirrors, hubcaps and engines. INDUSTRO WIPES are popular with automotive car dealerships, detailers, panel beaters and body shops where there is a requirement for a low linting, absorbent polishing cloth that will absorb well, and leave a streak free finish on windows, windscreens, mirrors and metal surfaces. They are very versatile and have multipurpose functionality. In addition to being a professional polishing cloth in the automotive industry, they are also used to clean, wipe and absorb automotive dirt, grease, grime and oil off engines, wheels and hubcaps. Being made of a low lint fabric, there are no streaks or fiber left after wiping leaving a spotless shiny surface. Their non-abrasive material will not scratch of damage vehicle windscreens or paintwork. This low lint vehicle cleaning cloth has industrial strength and absorbency from the polyester wood pulp composition. The wood pulp will absorb all liquids, chemicals, fuels and solvents easily and the polyester will ensure that the wiper has the strength and durability not to fall apart or tear easily. These automotive consumables are portable and disposable. With 300 cloths packed in a pull-out carton, they can be conveniently stored on garage workshop benches or in the vehicle for easy, ready access. So if you are looking for a low lint vehicle polishing cloth for anything that moves on wheels or floats on the water, be it your fleet of cars, buses, trucks, vans, cabs, campers, boats or yachts, try the industrial strength INDUSTRO WIPES! 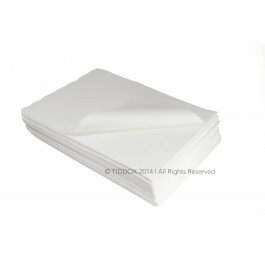 Other related products from TIDDOX 's range of automotive cloths, wipes and rags include the RAG ON A ROLL, the RHINO ROLLS and the SUPERMAX SHAMMY WASH CLOTH.